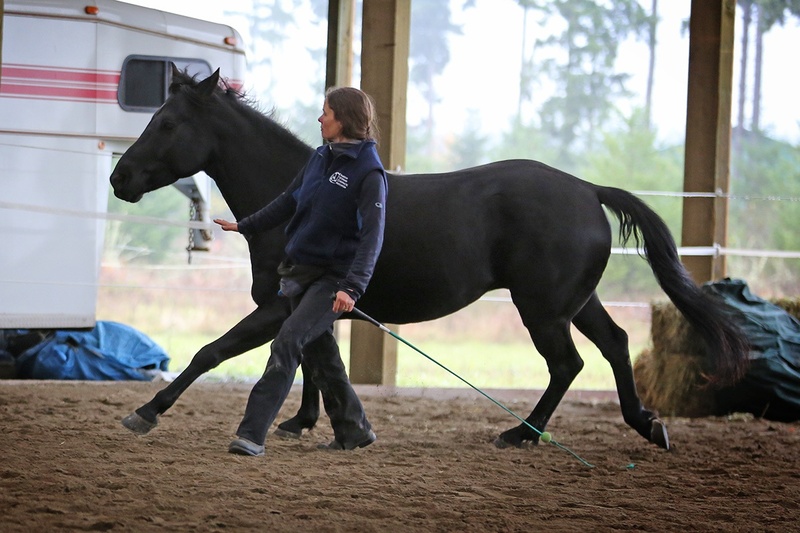 Although it is scarcely known and little understood, liberty horse training is the most profound aspect of horsemanship from the horse’s point of view. The reason for this is simple: it uses innate horse herd dynamics and subtle (difficult to notice) non-verbal communication to create a life-time bond between horse and human. I thank Robin Gates for my original training. Sometimes the cue is a slight head nod or raising of the head. Other times it’s a slight change in the direction of the horse’s ear or a soft allowance of the horse’s eye. For the human, an important cue might be moving one shoulder forward slightly or raising or lowering one’s energy. 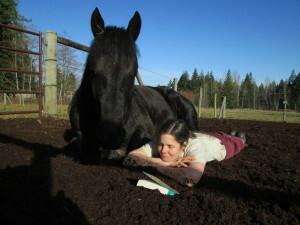 It does not matter how big a person is, the horse reads energy not stature. If I were four feet tall but projected strength through my shoulders, a strong determination in my direction, the horse may view me as a better leader than a six-foot person whose shoulders slouch and who aimlessly wanders through life. To watch someone doing liberty training might be as exciting as watching water boil. According to the laws of physics, a lot is happening–molecules are bombarding, flying up into steam. To the person bonding with such a mighty animal, the person learning and practicing liberty horse training, there is no greater feeling, no greater non-verbal melding of two distinct worlds. When I do a partnership dance with Tino, for example, I understand that I have transcended the limitations of being human to enter into the horse world and it often makes more sense. For example, horses are more consistent with themselves and one another than humans. Rules are rules in the horse world, no matter how much money or power one accumulates. Imagine living in a world with no greed or selfishness. My goal is to teach you my version of this powerful training tool so you can notice small but vital cues. In this way you can powerfully communicate your intentions, overcoming poor training or miscommunication, see things from your horse’s point of view and perhaps, through that lens, see yourself in a whole new light as well.